A man arrested for attempting to illegally smuggle a Bengal tiger cub in the passenger side of his car across the U.S.-Mexico border through the San Ysidro Port of Entry pleaded guilty to federal charges Tuesday. Luis Valencia, 18, admitted that he had contacted an individual in Mexico to get the tiger cub and smuggle it to the U.S., according to the U.S. Attorney's Office. He also admitted that he knowingly smuggled the Bengal tiger cub and neither he nor his passenger acknowledged the cub when they crossed the border--even though he knew the cub should have been declared. Valencia also admitted that he planned on bringing the cub to the U.S. for a commercial purpose. The cub was discovered on Aug. 23, around 1:30 a.m., at the San Ysidro Port of Entry. 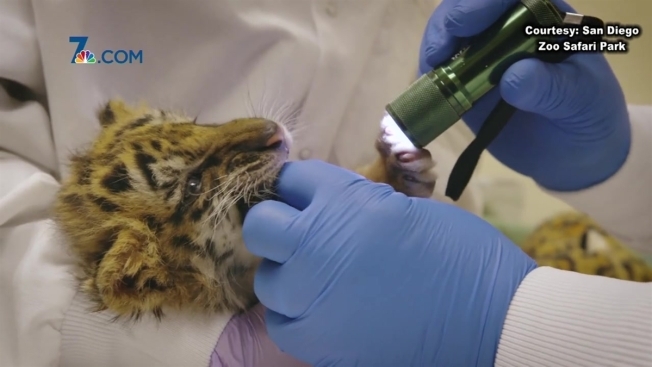 According to the U.S. Customs and Border Protection, officers found a tiger cub lying on the floor of the front passenger side of Valencia's car during a secondary inspection. When asked if it was a tiger, 21-year-old Eriberto Paniagua, a passenger in the vehicle, claimed it was just a cat, officials said. Paniagua was charged with one count of conspiracy and one count of smuggling contrary to law. The tiger cub was taken into the car of the U.S. Fish & Wildlife Service. It was then transferred to the San Diego Zoo Safari Park in Escondido and is in good health. The Bengal tiger, also known as Panthera tigris tigris, is native to India, Bangladesh, Nepal and Bhutan. It is listed as endangered under the Endangered Species Act, according to the U.S. Attorney's Office. Valencia will be sentenced on Feb. 20, 2018. He faces a maximum of 5 years in prison and a $250,000 fine. Paniagua was also charged with one count of conspiracy and one count of smuggling contrary to law. He will appear in court for a trial on Jan. 9, 2018.